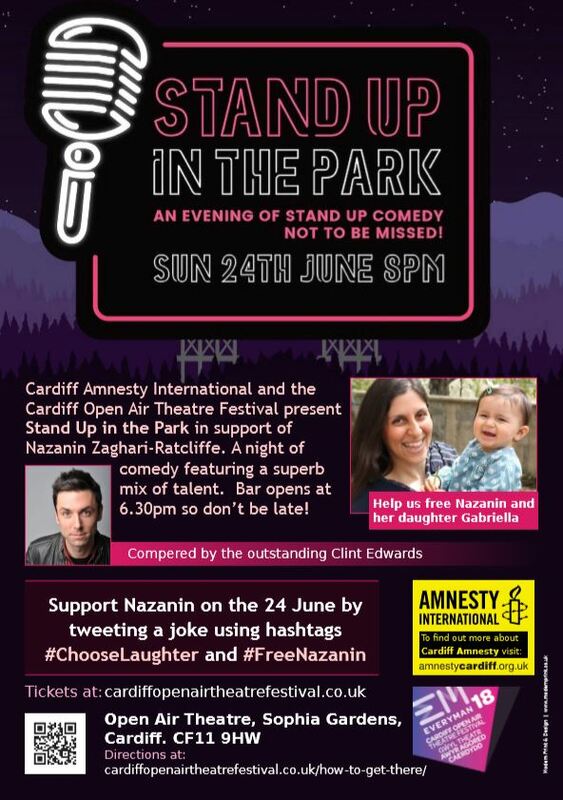 Amnesty International’s Cardiff group and the Cardiff Open Air Theatre Festival are producing a night of comedy in support of the jailed British woman Nazanin Zaghari-Ratcliffe. The Stand Up In the Park event – the second instalment of “Naz Night” – will see comedian Clint Edwards hosting a selection of fellow comedians in Cardiff’s Sophia Gardens on the evening (8pm) of Sunday 24 June. Ms Zaghari-Ratcliffe, 39, is a UK-Iranian dual-national who has been in jail in Iran for more than two years after being arrested during a family holiday with her infant daughter Gabriella in April 2016. Subjected to an unfair trial and sentenced to five years in jail, Zaghari-Ratcliffe was recently informed she faces a new charge and is “likely” to be convicted. “In an ideal world we wouldn’t have to stage another night for Nazanin, but she’s still behind bars and so we hope the people of Cardiff will come and enjoy this brilliant night of comedy. “Nazanin is a prisoner of conscience who should be released immediately. Attendees at the event are being encouraged to tweet their favourite jokes of the night, using the hashtags #ChooseLaughter and #FreeNazanin to help raise awareness of her case. Nazanin Zaghari-Ratcliffe, 39, a British-Iranian dual-national, was arrested at a Tehran airport on 3 April 2016 prior to boarding a plane back to the UK after a regular family visit to the country with her infant daughter Gabriella. After being detained for over five months, initially in solitary confinement for 45 days without access to a lawyer, Ms Zaghari-Ratcliffe was sentenced to five years in prison in September 2016 after being convicted of “membership of an illegal group” in a grossly unfair trial by a Revolutionary Court in Tehran. Zaghari-Ratcliffe is currently held in Tehran’s Evin Prison, where her requests for periods of temporary release – for which she has been eligible – have been repeatedly denied. She is suffering from numerous health problems – including severe arm, neck and back pain. There have also been serious concerns over her mental state. Amnesty has designated her a prisoner of conscience targeted solely for the peaceful exercise of her rights to freedom of expression and association, and has called on the Iranian authorities to release her immediately and unconditionally.